Dorm decorations are the dorm supplies that people will notice, and that will be especially true if it's loud and colorful! 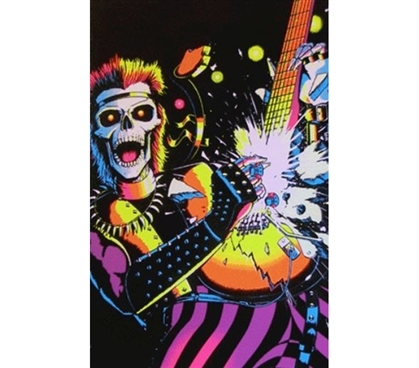 That's how this Rockin Skull Blacklight Poster will be, as it's the sort of college decoration that's made to take center stage! When you're choosing posters for college, don't just choose any old cheap posters. Choose those that can light up with black lights! This poster, when exposed to a black light, will have a much different look to it and will be the sort of college poster that transfixes. College decorations should definitely be fun dorm stuff, and posters for college that react to black lights certainly will be just that. So have some fun dorm shopping and picking out cool dorm room posters, as they're a vital part of any good dorm supplies shopping checklist.